Unicorns are basically the mascot of 2018! Everybody loves unicorns in all their majestic, magical beauty. 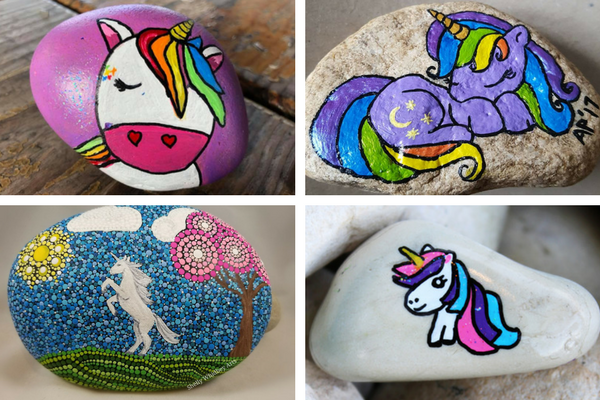 So why not paint a unicorn on a rock?! What do you do, though, if you want to paint a unicorn on a rock but you aren't sure how to draw a unicorn? You use a stencil, of course! Plaid crafts has a great unicorn stencil available as part of their fabric creations line and it made an awesome rock painting project! Just be sure to look for a rock big enough to accommodate the stencil. I used a variety of paint techniques to get the look I was going for on my unicorn painted rock. The good news is that nothing I did was hard and you could totally make this rock as an adventurous beginner! Shopping for supplies at Hobby Lobby? Don't forget your coupon! Watch how to draw a unicorn step by step with the help of a unicorn stencil. If the video does not play in the space directly below this paragraph, you can also view a shorter version of the How to Paint a Unicorn Rock Video on the I Love Painted Rocks Facebook page. This stencil I used to draw the unicorn is adhesive but because rocks are often not totally flat, I think you should leave the adhesive backing on and just treat this like a regular stencil. Use your pencil together with the stencil to trace the outline and draw the unicorn onto your rock. Using a small, detail paint brush and the ColorShift paint, follow around the outside line of the unicorn drawing and then fill in the background with a larger paintbrush. Use white, pink, blue, and yellow Uni-Posca Paint pens to draw over the pencil lines of the unicorn you drew on step 1. Fill in the shapes as appropriate. If you are trying to duplicate the unicorn I drew on my rock, refer to the image at the top of this post to see what color I made each part. Use the black posca pen to trace all the outlines as well as add an eye, nostril and smile. We are going to add glitter to our magical unicorn drawing but because decoupage formulas tend to cause Posca pens to get smeary, first you need to use a spray sealer (like this one) over the whole rock and let it dry (about 20 minutes). This will protect all of the work you have already done on your unicorn drawing. If you don't want to add glitter, add a second coat of spray sealer and you're done! Want to add sparkle and shimmer? Move on to step 5. To add sparkle, use the Martha Stewart Decoupage Medium in Sparkle Finish and paint it over the unicorn (or the whole rock!). We are using this instead of loose glitter because being bound in the decoupage medium will keep the glitter from coming loose in the environment and turning into glitter. The particular decoupage medium I used will become waterproof and outdoor safe after sitting and curing for 30 days. So set your rock aside to do that OR give it another coat of spray sealer before you hide it outside. 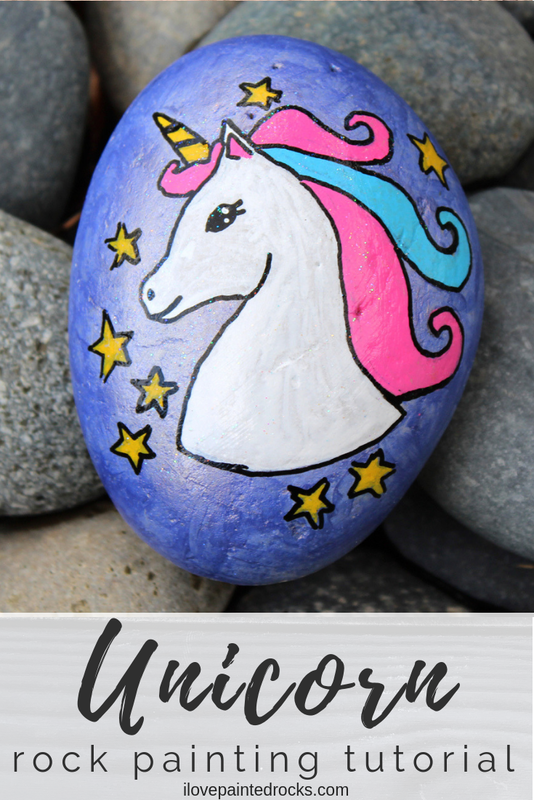 If you are inspired by this unicorn rock painting idea and decide to make your own, won't you share? Unicorns are basically the mascot of 2018! Everybody loves unicorns in all their majestic, magical beauty. So why not paint a unicorn on a rock?! These are my step-by-step directions for how to draw a unicorn on a rock - even if you don't have drawing skills! 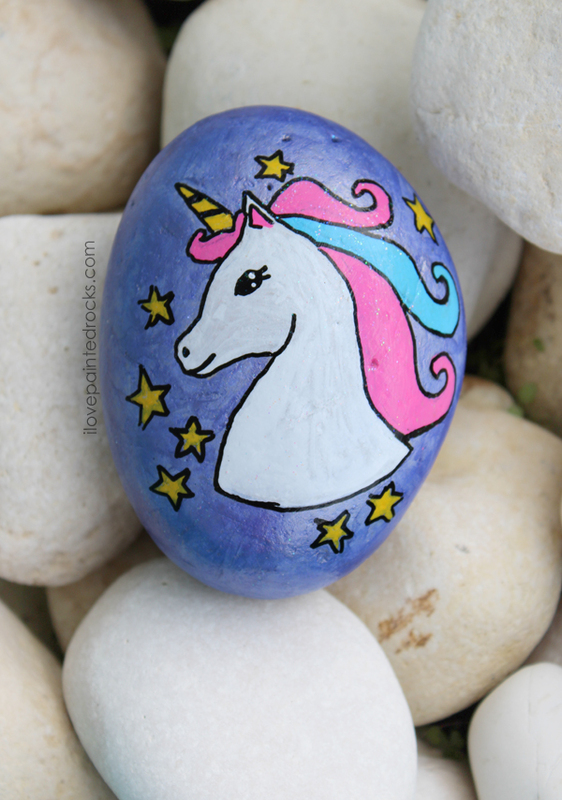 In the end, you will have a beautiful unicorn painted rock to keep or hide. Even though the stencil is adhesive, leave the backing on the adhesive portion of the stencil. 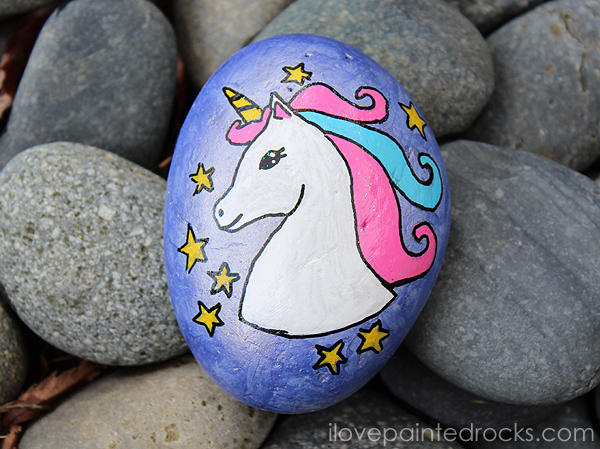 Use your pencil together with the stencil to trace the outline and draw the unicorn onto your rock. Use white, pink, blue, and yellow Uni-Posca Paint pens to draw over the pencil lines of the unicorn you drew on step 1. (use photo as a guide) Fill in the shapes with the appropriate colors. Because decoupage formulas tend to cause Posca pens to get smeary, first you need to use a spray sealer over the whole rock and let it dry (about 20 minutes) before moving on the next step. Don't want glitter? You can stop here -- although you may want to use a second coat of spray sealer for good measure. To add sparkle, use the Martha Stewart Decoupage Medium in Sparkle Finish and paint it over the unicorn (or the whole rock!). Allow to dry completely. If you used the exact decoupage medium I listed, the rock will become waterproof and outdoor safe after sitting and curing for 30 days. Set your rock aside to do that OR give it another coat of spray sealer before you hide it outside.